I enjoyed a recent post from Boak and Bailey, which asked whether brewing should be termed as a science, art, or something else entirely. The comments prompted all sorts of thoughts in my head about how you can measure the artistic or scientific nature of brewing. Yet again, I find myself pondering the notion of ‘craft beer’. Wait! Don’t leave! I’m not about to try and define it. I think we’ve all wasted enough of our lives doing that. What I mean is, art is a highly subjective field. Science™, however, whether it’s a child in a classroom or a theoretical physicist in a billion-pound laboratory, is defined by measurable results. Surely then, our hazy, multi-faceted, ever-changing notions of craft beer better fit into the category of art. On the other hand, brewing (at least at a professional level) requires an intimate knowledge of microbiology, and processes that are designed to produce, and reproduce, a liquid to a specific set of characteristics with a very fine margin of error. If not an ‘exact science’, is brewing not then at least some sort of science? Definitely. But then, do we consider the humble layman homebrewer a scientist, or indeed the industrial brewer an artist? Should brewing be considered by the scale at which it is being done? We could have the same discussion about chefs and their ‘art’. Surely the Michelin-star-boasting chef would not tolerate the chip fryer at a greasy spoon to be deemed an artist. Is creativity a factor here? 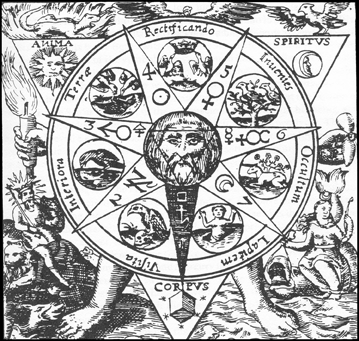 (uncountable) The ancient search for a universal panacea, and of the philosopher’s stone, that eventually developed into chemistry. (countable) The causing of any sort of mysterious sudden transmutation. (computing, slang, countable) Any elaborate transformation process or algorithm.” – Wiktionary. I would certainly argue that beer is the universal panacea, at any rate. We know that brewing was once thought to have involved divine intervention. Before people worked out what yeast was and how it worked, some called the process of fermentation godisgood. That might be an old beer wive’s tale (most “beer facts” seem to be, sadly) but consider the ‘mysterious sudden transmutation’ that was associated with alchemy. The transformation of liquor (water), hops (or it’s predecessor, grist) and malt into an intoxicating beverage that brought with mirth and merriment must have seemed alchemical, if not magical. Fermentation and conditioning may not be ‘sudden’, but they can certainly be mysterious processes. Maybe we are better off with something less abstract, like skill, which at least covers the ability and craftmanship of the brewer, if not entirely recognising the stranger, weirder aspects of brewing. That old marketing buzz word artisan might be a better fit, but again, can all brewers be artisans? Is the correct, proper, accurate and fairest term for brewing just brewing? Perhaps it can be set apart from definitions as something special and unique. What do you think? I’m so glad I discovered your blog! What a great topic! Craft Beer, I suspect, was a term generated to qualify beers that were good, but defied CAMRA’s ‘Real’ Ale tag. Since no one owned the phrase, everyone has grabbed on to it to the point of bastardisation, culminating in that recent business in the US that locked out big brewers from using the word. Craft is a poor choice, really, It firstly alienates the casual drinker – the one time I used the term amongst a non-beer geek crowd, I received blank stares. I quietly shelved the word in a dark cupboard and boarded it up, never to be spoken again. Secondly, craft paves over the amount of science that goes into brewing. Sticking down pasta onto paper with PVA glue is a craft – at professional levels, beer requires understanding of biochemistry, mathematics, metallurgy, engineering, biology, physics… if you went as far as to consider the external sociological factors, brewing is damn near the nexus of all sciences. Which, perhaps, leads us neatly to alchemy – the pursuit of science in all its forms before science was discovered and broken down into separate disciplines. Still, ‘Alchemy Ale/Beer’ isn’t going to catch on as a generic term. Alchemy also forgoes the artist – those people who lead first by taste, and worry about the science after, since the science is merely a tool to ensuring great tasting ales can be reproduced flawlessly time and time again. Alchemy also presents an image of a mad man in a shed (of which there are thousands in the brewing world, but that doesn’t encompass all brewing). To focus on artisanal, craft, science, alchemy, or industrial aspects undermines brewing as a whole, because it is comprised of all of these facets. So, yes, you’re absolutely right: brewing should be respected as being brewing, without prefix or qualifier. Thanks, Craig. I’m personally in favour of leaving ‘craft’ behind, and leaving it as just ‘beer’. Just call it all beer, and let us each be the judge of its quality. Like you say, brewing encompasses so many different areas of knowledge, and so many different practitioners at different levels of skill and ability that it really is a discipline and field entirely of its own. That’s what makes it so exciting. That and the beer, of course.